One of the best monitors on the market. The A7X beats the original in almost every way. New X-ART ribbon tweeter. Updated mid-woofer. New amps. We're big fans of the original Adam A7s, released back in 2006. With a 6.5-inch mid-woofer and excellent ribbon tweeter, the A7s lend themselves particularly well to electronic music. Not content to rest on their laurels, Adam have been hard at work updating their product line over the last year or so. We didn't think there was much wrong with the original model, but the A7 has now been replaced with the A7X, so we were very keen to see how it sounded. "Imaging is also seriously impressive, making it easy to place sounds around the stereo field." On the surface, the A7Xs appear broadly similar to the originals but closer inspection reveals that almost every element has been redesigned. The main update focuses on the high end: Adam's ART (Accelerating Ribbon Technology) folded ribbon tweeter has been upgraded to the X-ART, which offers a ﬂat-frequency response all the way up to 50kHz (the X stands for eXtended). The concept of ultra-high frequency response isn't anything new - as far back as the 1960s speaker manufacturers were using 'super tweeters' to carry out a similar job - but it's an unusual approach in the pro audio world. The 7-inch mid-woofer has also been redesigned with a larger voice coil. Elsewhere, the changes are smaller but still signiﬁcant. At the front, the bafﬂe has been redesigned with two ports rather than the original one. Round the back things are broadly similar to the original model, with XLR and RCA inputs, plus controls for tweeter level and high and low shelf ﬁlters. Inside, the A7's 50W PWM amps have been replaced by a 50W class A/B design for the highs and 100W PWM for the lows. Critically listening to a mixture of mastered tracks and unmixed sources, the ﬁrst thing that stands out is the exceptional detail. Given that human hearing only extends to around 20kHz at best, you may wonder what the point of the A7X's ultra-high frequency response is, but the accuracy of the sound justiﬁes Adam's approach. Transients are reproduced with incredible clarity, creating an extremely detailed, precise sound. Imaging is also seriously impressive, making it easy to place sounds around the stereo ﬁeld. The main criticism of the A7s was that the tweeters were a little bright, to the point of being fatiguing to some listeners but simply a bit too prominent for others. The highs are noticeably less bright on the A7Xs, albeit still exceptionally detailed and revealing. The crossover frequency has been raised from 2.2kHz to 2.5kHz and the transition from mid-woofer to tweeter is practically unnoticeable. We didn't like the mid-range of the bigger A8X model when we reviewed it back in March, but the A7X doesn't suffer from the same problem - the mids are accurate and revealing, with none of the hi-ﬁ smoothness of their bigger brother. At the very bottom end, we'd be quite happy to work on the A7Xs without a subwoofer. Testing with some synth bass sounds, the frequency response extended comfortably down to around 50Hz before rolling off. 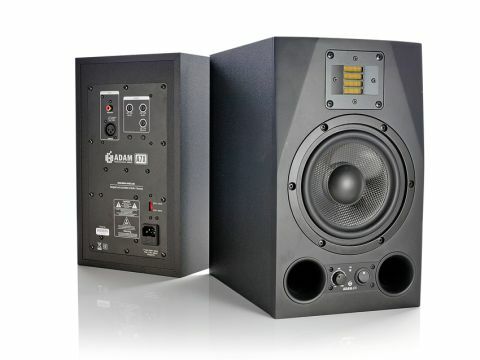 The mid-range monitor market is extremely competitive, but to our ears the Adams are easily as good as any of their rivals and we'd be tempted to choose them over anything else in a similar price range. Whether you go for the A7X or something like the Dynaudio BM5As or Genelec 8030As will probably come down to personal taste, but the A7X is a top quality monitor that improves on what was already a great design.